Traditional Roast Ground Coffee - Experience a complex, mild-roasted cup of coffee with caramel undertones that is meant to be savored. 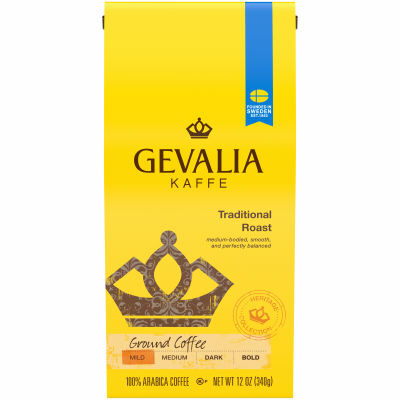 Gevalia Traditional Roast Ground Coffee features perfectly balanced 100% Arabic coffee that delivers bright, aromatic flavor you will love any time of the day. Refreshing and Alluring - With mild-bodied flavor characteristic of the finest coffee beans, you will enjoy a delicious cup of perfectly brewed coffee every time. Rich, and never bitter, it blends smoothly with milk to create a sophisticated beverage, so take a moment to relax and indulge. This package contains one 12 oz bag. Serving size 1 wrapped link (86g).